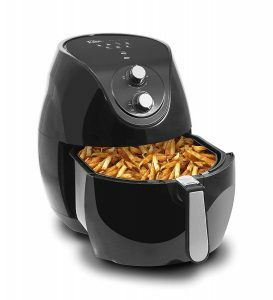 Black Elite Platinum EAF-553 is a sleek and modern 1800-watt power air fryer with an extra large 7-quart capacity, to fry, cook or bake. The average rating for this and the smaller capacity Elite Platinum Air Fryers is 4.3 out of 5 stars by 152 customers, indicating a fair amount of customer satisfaction. You have the option to get it as the very small 2.3 quart size EAF-801 (white or black), 3.4-quart EAF-1200D (black), 5.5 Quart EAF-1616 (black) or the 5.6 quart size 1800H. You’ll be able to achieve the same fried taste- moist, tender and juicy inside and crispy and crunchy outside by adding very little to no oil and eat healthier without feeling any guilt. You can feed your whole family by cooking in one of the larger capacity models. Or the single people may prefer the smaller 2.3 or 3.4 or one of the medium ones if they’ll cook only for themselves. You’ll get these tasty and healthy results much quicker with its super heating convection fan than the regular stovetop or oven. You have the small silver time and temperature knobs to set the time up to 60 minutes and the temperature between 140 and 400 degrees Fahrenheit. This way you have more control over the cookers and what you’re making. As you won’t need to use any oil there won’t be any oil mess on your kitchen counter or your walls as it cooks inside a closed area. The 60-minute timer will turn the unit off when the cooking time is up. In the largest Elite Platinum Air Fryer you can fit in up to 7 quarts of food, or around 6-7 pounds of French fries. It has a powerful 1800-watt power motor (110-120V – 60Hz), the unique vapor system and the super heating convection fan that circulates the hot air quickly. The handle is cool to touch even if it gets a little hot on the outside. There are two indicator lights for Power and Heat and the ideal time and temperature for 7 different basic food items (Simple Cooking Guide). The basket and drawer pan are safe to be put in the dishwasher and you can wipe the exterior with soap and damp cloth. You’ll get a colored recipe booklet that has more than 25 recipes. 7-quart capacity is very large and will let you make large batches of chicken wings, fish sticks, churros, egg rolls, onion rings, potato wedges, different types of fish including salmon and French fries very quickly and easily. You can make different meals, entrees, snacks and desserts and some at the same time. You can cook different parts of the chicken, breaded or un-breaded and you’ll get awesome results. But you may want to spray some olive oil on the breaded for even better results. 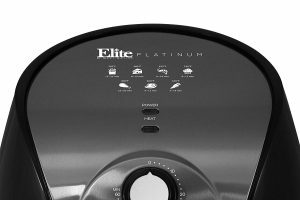 Black Elite Platinum EAF-553 weighs 11 pounds and measures 15 x 12.8 x 15.2 inches. It is a bit large in size and large enough to cook a whole chicken inside within 45 minutes, if you cook one side then flip it half way. The high power and cooking efficiency are great, has a large capacity, runs quietly, has a sturdy and durable construction, is easy to clean and you won’t be likely to encounter any problems. This is not a dehydrator or a smoker and you can’t make things like beef jerky. One of the customers had a problem with the peeling of the non-stick coating and they were sent a replacement basket quickly by the customer service. Then they were sent a brand new air fryer when the heater burnt out on their first one. Overall you seem to be getting decent value for the dollar.